It's 2:20 am for me...and I'm up waiting for a work meeting that starts in about 10 minutes. Thought I'd make a quick post while I'm waiting.....to keep me from falling asleep! I finished my LHN piece, Nature's Beauty! I'm so happy with it! Only 10 minutes for a quick post? It takes me much, much longer than that. Anyway, I love your pillow finish. The ruffles on the side are so cute! Beautiful work, Lesli. congratulations on the finish! A very beautiful pillow. You did a great job. 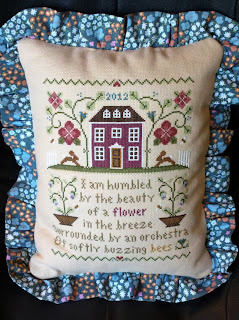 I love LHN designs and this one is no exception. Lovely stitching and brilliant finishing. No one would know it was your first pillow. So early for a work meet! Yikes! Glad you took a moment to post your lovely finish. Looks wonderful :) Excellent Job!!!! This is a wonderful finish, good work! It's beautiful. I have been frogging my Love Quilt square for days now. Stitches in, stitches out, stitches in, stitches out...praying I make the June 1st deadline and that I finish the diamond in the middle today so that I can move on from this horrific backstitching! What a time for a meeting. Hope you were able to stay awake. The pillow is perfect. Great Job!! Oh my goodness, what a stunning finish! 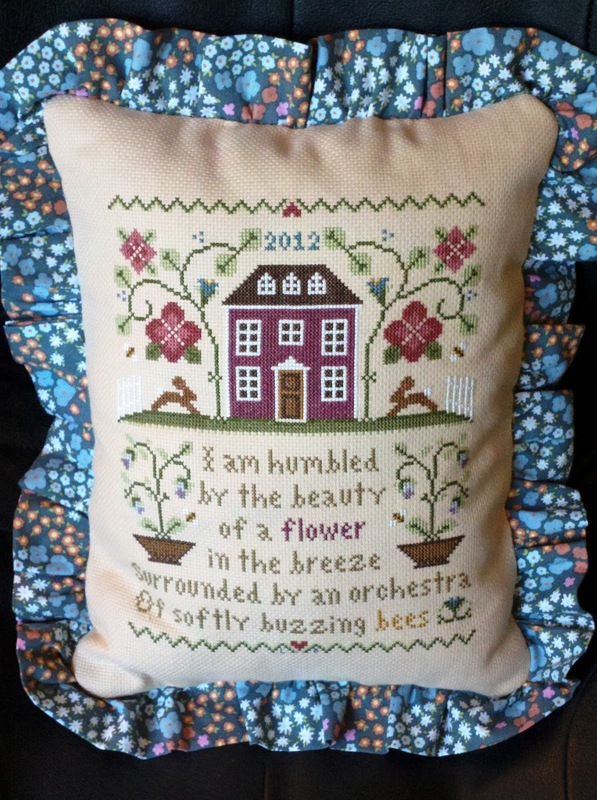 I'm so pleased my chart went to a loving home :) Congratulations Lesli, it's gorgeous! 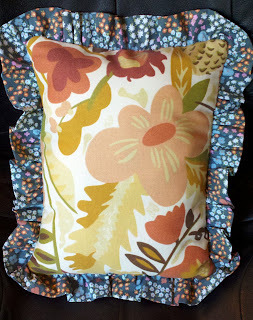 aww it is so pretty..
Beautiful finish and excellent choice of fabrics! Congrats on your finish. It is stunning and I can't believe it is your first finish this way. Hope you get to go to bed after your meeting. Congrats on the finish Lesli. You did a great job on the pillow. I love it. The pillow is gorgeous - love your fabric choices. Nobody is going to believe it's your first. Congrats on a b-e-a-u-t-i-f-u-l finish! It's your first pillow finish?! You can be proud :D Great work sweetie!!! Congrats on your finish and your finishing! Gorgeous work! gorgeous finish :D I love the effect!